Magnitude +7.9 asteroid 2 Pallas is currently an easy binocular target, cruising through the southwestern corner of the constellation Boötes (the Herdsman) less than the span of a fist at arm’s length to the west of unmistakable Arcturus, the northern celestial hemisphere’s brightest star. 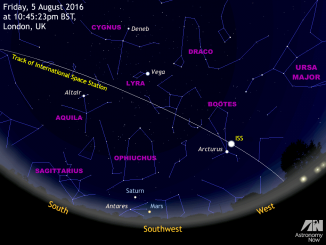 You can find Arcturus high in the southeast around local midnight in the UK and Western Europe. The red circle represents the field of view of typical 8× binoculars. Pallas is at opposition on 10 April and passes just 1.7 arcminutes northeast of magnitude +2.7 star eta (η) Boötis at 22h UT (11pm BST) the same day. For the interval shown, Pallas is moving at a rate of &frac13; degree per day relative to the background stars. AN graphic by Ade Ashford. On Wednesday, 10 April, asteroid 2 Pallas reaches opposition (see note at the foot of the page) in the constellation of Boötes the Herdsman. This fascinating asteroid, which is likely a remnant protoplanet, is therefore at its brightest and lies closest for 2019, some 1.6 astronomical units or 239 million kilometres from Earth. As seen from the centre of the British Isles, Pallas currently attains a maximum altitude of 54 degrees above the southern horizon around 2am BST, ensuring that it is very well placed for observation from northern temperate latitudes. This image of asteroid 2 Pallas was taken by the European Southern Observatory’s SPHERE (Spectro-Polarimetric High-contrast Exoplanet REsearch) instrument, installed on ESO’s Very Large Telescope (VLT) at the Paranal Observatory, Chile. 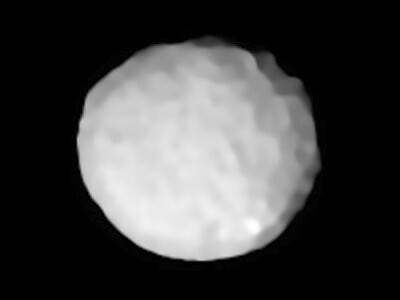 Named after the Greek goddess Pallas Athena, Pallas is about 510 kilometres wide. It’s the third-most-massive asteroid in the main belt and one of the biggest asteroids in the entire solar system. Pallas contains about 7 percent of the mass of the entire asteroid belt — so hefty that it was once classified as a planet. Image credit: ESO/Vernazza et al. That Pallas should currently be found some 28 degrees north of the ecliptic immediately reveals an important fact about this asteroid: a high orbital inclination. So much so that the orbit of Pallas is tilted by almost 35 degrees to that of Earth. 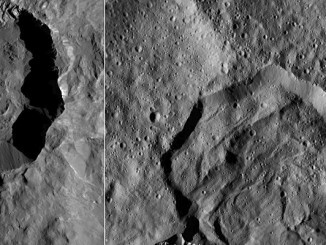 Unlike 1 Ceres and 4 Vesta that have been photographed in great detail from close orbit by NASA’s Dawn spacecraft, Pallas has not been studied by a spacecraft thus far. Pallas has, however, passed in front of stars on a number of occasions and these occultation events have established its dimensions to be 550 x 516 x 476 kilometres (342 x 321 x 296 miles). With a mean diameter of 512 kilometres, Pallas is therefore about one-sixth the size of our Moon. Pallas also has a very high axial tilt of 84 degrees, meaning that areas near the asteroid’s poles experience continuous sunlight for up to two years, while other parts of its surface can remain in constant darkness or constant sunlight for about an Earth year. Pallas rotates on its axis in a period of 7 hours 48.8 minutes with an orbital period of 4 years 224 days at a mean distance of 2.77 astronomical units from the Sun. A lithograph portrait of the German astronomer Heinrich Wilhelm Matthäus Olbers (1758-1840) by Rudolf Suhrlandt. Image credit: Wikimedia Commons. Dwarf planet Ceres, the largest object in the asteroid belt, was discovered by Italian Catholic priest and astronomer Giuseppe Piazzi on the first day of the 19th century. 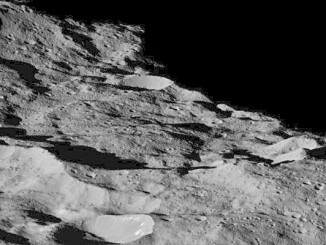 However, owing to a poorly determined orbit before it slipped into conjunction behind the Sun, Ceres was lost for a time. 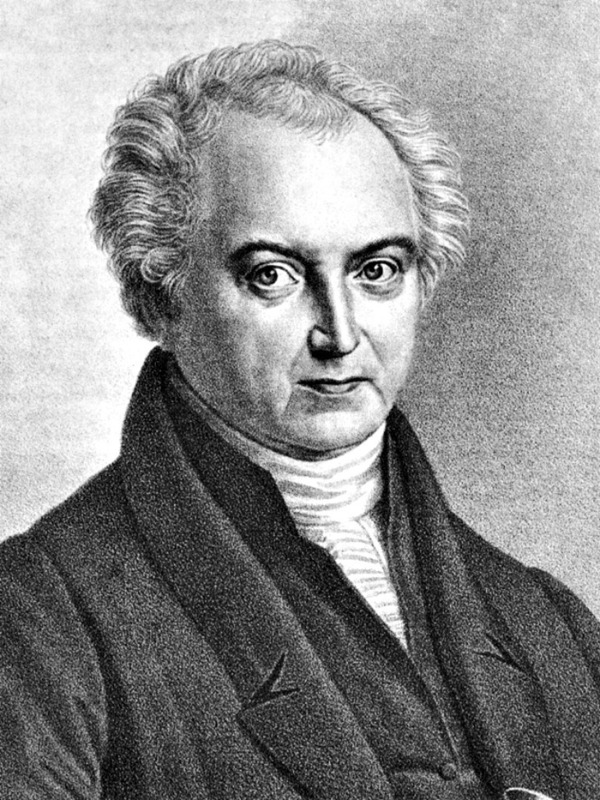 German physician and astronomer Heinrich Wilhelm Matthäus Olbers (1758-1840) was observing Ceres three months after he helped recover it based on a refined orbital calculation by the young Carl Friedrich Gauss when, on 28 March 1802, Olbers found another seventh-magnitude moving object just 7½ degrees away; he had found asteroid number two, which he called Pallas. Heinrich W. M. Olbers was evidently a fascinating character. He was a medical practitioner in Bremen by day, but by night studied the sky from an observatory in the upper storey of his home — apparently, he never slept more than four hours. His diligence paid off with the discovery of periodic comet 13P/Olbers on 6 March 1815. He also dabbled in cosmology, as anyone who has encountered Olbers’ paradox will know. Owing to its rather eccentric orbit, the opposition distance of Pallas varies considerably. At rare perihelic oppositions, Pallas can attain magnitude +6.5 making it an easy binocular object and a potential naked-eye target for particularly keen-sighted individuals. At its faintest, Pallas can sink to almost magnitude +10.7. For its 2019 opposition on 10 April, Pallas is a comfortable binocular target at magnitude +7.9. 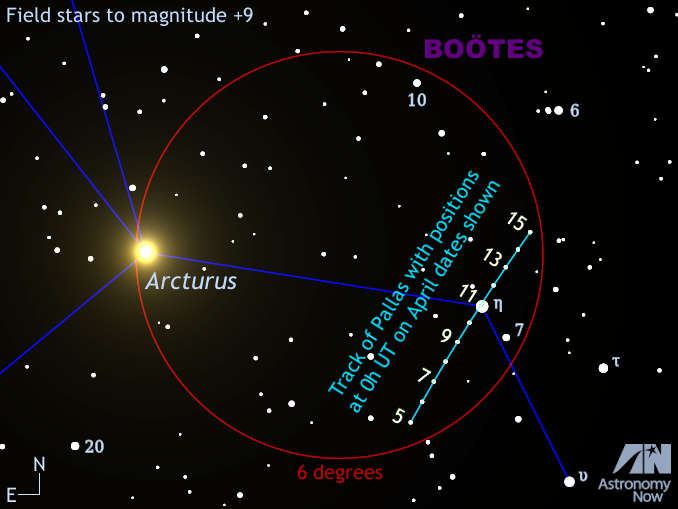 For ten nights starting 5 April 2019, Pallas and unmistakable magnitude -0.05 Arcturus – the northern celestial hemisphere’s brightest star – lie within the same field of view of typical 8× binoculars (see the star chart at the top of the page). Don’t miss Pallas’s close conjunction with magnitude +2.7 star eta (η) Boötis (otherwise known as Murphid) at 22h UT (11pm BST) on the night of 10 April when the star and asteroid are just 1.7 arcminutes apart. This topocentric ephemeris of asteroid 2 Pallas is computed for the centre of the British Isles for the period in April 2019 during which it is nearest to Earth and therefore brightest. 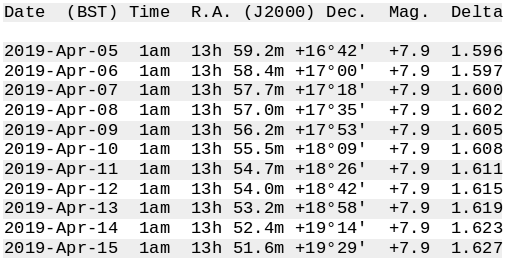 The mean J2000 epoch coordinates can be entered directly into the hand controller of a GoTo telescope. Data generated by NASA’s JPL HORIZONS system. Depending on the source that you use, the official 2019 opposition date of 2 Pallas is given as 6, 10 or 19 April. I’m following the definition used by The Nautical Almanac Office (USNO) and Her Majesty’s Nautical Almanac Office, where the ecliptic longitudes of Pallas and the Sun differ by 180 degrees, which occurs on 10 April 2019 close to 01h UT. If you chance upon a bright ‘star’ crawling across the sky in an arc from west to east, an object that doesn’t flash or possess red and green running lights (which is an aircraft), then you can be fairly certain that you’re looking at the International Space Station (ISS). Find out when and where to see it from the British Isles and Western Europe this week.